yesh thanks for your kind words. Is it hard to scale it down to a 4-step sequencer? With only one 74HC4016, right? 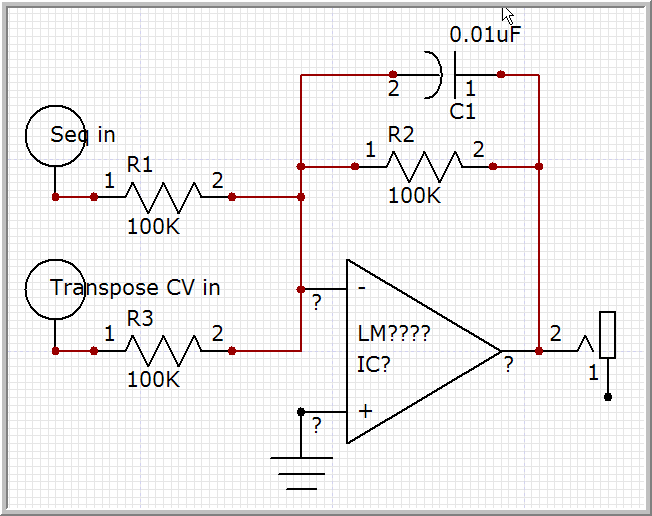 Another question I have is why both b and e on the NPN-transistor is connected to ground? If I remeber right there have to be a voltage over b-e to open c-e, right? The IC gives out a positive voltage (whatever supply voltage you give it) to the LED, and the other side needs to go to 0v AKA ground. Like hooking it up to a PP3 battery. The + is regarded as 9v, and the - is 0v AKA ground. Could there be a pot just before CV out to pitch all the steps simultaneously? Could one timer be used for more than one of these sequencers at a time? like a multi-channel? one timer can be used to many modules - so all the modules are synchronized all in one timer. You probably should put a buffer amplifier on the output of this circuit because different valuses of loads will change the voltage. To answer Pehr's question, it's not a great idea to just put a pot in series with the output of this devices because it will load the output and also, you can only attenuate the output. This will have the effect of changing the scale. If you want a transpose, you should use a mixer. I'd suggest using one opamps, for a mixer of the sequencer CV and a a buffer (from a pot of any other module) and one to invert and buffer the mixer. You will have to switch the connections of the step pots around because mixers invert, but that's no big deal. Yes. The transpose signal can be a keyboard, and osc, LFO, or even just a pot. Add more 100K resistors on the left side of the drawing and you can add more things to mix in. I don't have any DIP switches around (AKA Piano switches) could somebody confirm that the pins on the bottom of this is arranged like a 16-pin DIL package? I'm not sure what you mean by DIP switches Mac. Indeed, after checking, it seems they are called DIL switches which answers my question rather well. Seems getting "merry" at christmas hurt a few brain cells. sorry about the DIP/DIL confusion - is just that the vocabulary at my work uses the word "dipping" (in Finnish "dipata")- every time we set up a address of some lights whit these DIL- switches so it got me confused ... sorry. Macaba have you breadboarded this design? I have not breadboarded it yet, but it looks like I will then, and i'll test it out in every way I can to try spot bugs. I've been playing around with this circuit and have noticed a couple of points which aren't obvious from the current schem. 1. The clock inhibit (pin13) needs to be held low otherwise it will float which may inhibit the sequence. 2. The reset on step switches do need to be a rotary so that the reset is held low except when you want it activated. Otherwise you'll get a floater which will repeatedly reset when you don't want it. I'm about to add a second 4017 and a 4011 (4*2I-NAND) to cascade them for a 16 step. Looks like I'll be doing a stripboard of this soon. Well I went with a 4081 (4*2I-AND) though I'm sure you can get similar results with some nand gates. Anyway, it's flashing through a 16 step sequence even as we speak, er,,..... type. I'm gonna have another look at the schematic publisher to see if I can draw it for ya.